The Gulf of Mannar Marine National Park is a protected area of India consisting of 21 small islands (islets) and adjacent coral reefs in the Gulf of Mannar in the Indian Ocean. It lies 1 to 10 km away from the east coast of Tamil Nadu, India for 160 km between Thoothukudi (Tuticorin) and Dhanushkodi. It is the core area of the Gulf of Mannar Biosphere Reserve which includes a 10 km buffer zone around the park, including the populated coastal area. The park has a high diversity of plants and animals in its marine, intertidal and near shore habitats. Public access inside the Park is limited to glass bottom boat rides. Vilanguchalli, 0.95 ha 8°56′17″N 78°16′11″E﻿ / ﻿8.93815°N 78.26969°E﻿ / 8.93815; 78.26969, now 1 m below mean low tide level as a result of excessive coral mining. Kurusadai, 65.80 ha 9°14′49″N 79°12′34″E﻿ / ﻿9.24690°N 79.20945°E﻿ / 9.24690; 79.20945 was recently populated. Its surrounding shallow waters harbour three species of seagrass that are found nowhere else in India. Representatives of every animal phylum known (except amphibians) are found on this island. Tidal amplitude in the area is about .5m. There were two more islands named Pandayan and Punnaiyadi at 8°46′51″N 78°11′43″E﻿ / ﻿8.78075°N 78.19536°E﻿ / 8.78075; 78.19536 that were destroyed for construction of the new Tuticorn Port facilities. 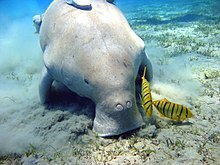 Dugong, a vulnerable marine mammal is the flagship mammal of the park. It is an important habitat for the Cetaceans: Indo-Pacific bottlenose dolphin, Finless porpoise, Spinner dolphin, Common dolphin, Risso's dolphin, Melon-headed whale, and Dwarf sperm whale. Larger whales include Sperm whale, Minke whale, Bryde's whale, Sei whale, and critically endangered species including Humpback whale, Fin whale, and Blue whale. About 510 (23%) of the 2,200 fin fish species in Indian waters are found in the Gulf, making it the most highly diverse fish habitat in India. Coral associated ornamental fishes belonging to the family Chaetodontidae, (butterfly fish); Parrotfish; Amphiprion spp (clown fish), Holocentrus spp (squirrel fish), Scarus spp (parrot fish), Lutjanus spp (snappers) and Abudefduf saxatilis (sergeant Major) are abundant. A unique endemic species of Balanoglossus – Ptychodera fluva, a living fossil that links invertebrates and vertebrates, has been recorded only at Kurusadai. Four species each of shrimp and lobster, 106 species of crab, 17 species of sea cucumber, and 466 species of mollusc including 271 gastropods, 174 bivalves, 5 polyplacophorans, 16 cephalopods and 5 scaphopods, 108 species of sponge, and 100 species of echinoderm occur in the Gulf. The coral fauna includes 106 species from 30 genus of hermatypes and 11 species from 10 genus of ahermatypes, including 13 new species, giving a total of 117 species from 14 families and 40 genus. The reefs in this area are narrow fringing reefs located 150 to 300 m. from the shore of the islands and patch reefs rising up from depths of 2 to 9 m. and extending up to 2 km. long and 50 m. wide. Large areas of these reefs are in generally poor condition due to destructive human activities of the 150,000 persons living along the coast. Nutrient and other pollution loads are high due to agriculture, deforestation, industry, urbanization and septic pollution. It appears that the Coral reefs of the Gulf of Mannar Marine National Park seem to be healthy and in good condition, despite high rates of sedimentation and other threats. However, live coral cover is only about 35%. Various algae cover much of the dead coral. Stony coral species belonging to Poritidae and Faviidae sub orders constitute the dominant reef builders here. Coral reefs near some of the islands have been heavily damaged by exploitation as raw materials for industrial ventures such as cement industries, brick manufacture, masonry work and lime kilns. Though legal quarrying of the reefs is now stopped, up to 250 m3/day of reef were destroyed for many years. The islands are uninhabited except for Krusadai, Musal and Nallathanni islands where antipoaching sheds are operating. Along the coast near the park there are about 125 villages which support about 100,000 people who are mainly Marakeyars, a local community principally engaged in fishing. Experts say that Vaan Island, one of the four islands of the Tuticorn group, has split in two and if immediate efforts are not taken then the island would soon vanish under the sea. Vaan Island, which is the southernmost of the 21 islands in the Gulf of Mannar, was initially spread across 16 hectares, but had shrunk alarmingly by around 10.3 hectares to its current 5.7 hectares in less than three decades. According to J K Patterson Edward, director of Suganthi Devadasan Marine Research Institute (SDMRI), Tuticorin,"Rampant coral mining by people of the fishing villages along the coast is the main cause of the devastation to the island. Coral mining was banned in 2005, but the damage had already been done." Two of the 21 islands have already submerged around a decade ago. Glass-bottomed boats available at Mandapam cater to tourists visiting the area. Access to the islands is prohibited. 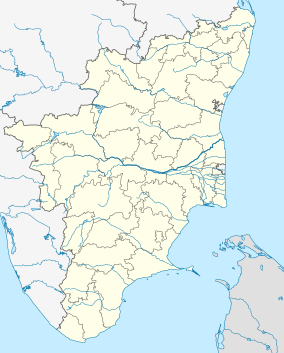 The nearest railway stations are at Mandapam and Tuticorin. ^ UNDP (1994). "Conservation and Sustainable-use of the Gulf of Mannar Biosphere Reserve's Coastal Biodiversity" (PDF). UNDP, Project Brief, New York. Archived from the original (PDF) on 21 July 2011. Retrieved 15 October 2007. ^ Shaunak B Modi (2011). "Gulf of Mannar Marine National Park - Tamil Nadu Forest Dept. (GOMNP)". Gulf of Mannar Biosphere Reserve Trust. Archived from the original on 2 November 2007. Retrieved 15 October 2007. ^ a b Undp gombr (October 2006). "Annual Project review, Conservation and sustainable use of the Gulf of Mannar Biosphere Reserve's Coastal Biodiversity" (PDF). UNDP GEF APR/PIR 2006 – Biodiversity (1 July 2005 to 30 June 2006). UNDP. Retrieved 16 October 2007. ^ a b IOM (2007). "Gulf of Mannar Biosphere Reserve:". Ecologically Important Areas of Tamil Nadu Coast. Institute for Ocean Management, Anna University. Archived from the original on 6 January 2008. Retrieved 15 October 2007. ^ a b c "Gulf of Mannar Marine National Park". Ecologically Important Areas of Tamil Nadu Coast. Tamil Nadu Forest Department. 2007. Archived from the original on 27 October 2007. Retrieved 14 October 2007. ^ Jeganathan Stalin (2007). "Vegetation status in the offshore islands of Gulf of Mannar Marine National Park, Tamil Nadu". Wildlife Institute of India. Archived from the original on 21 July 2011. Retrieved 15 October 2007. ^ E.V. Muley; J.R.B. Alfred; K. Venkataraman; M.V.M. Wafar (2000). "Status of Coral Reefs of India". 9 ICRS, BALI. Archived from the original on 10 April 2009. Retrieved 15 October 2007. ^ Wells (1995). "Gulf of Mannar Marine National Park". 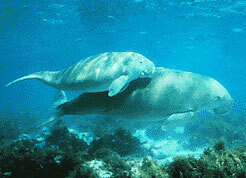 Cetacean habitat directory for MPAs, national and international sanctuaries. Whale and Dolphin Conservation Society. Retrieved 15 October 2007. ^ Hoon Vineeta (1997). "Coral Reefs of India: Review of Their Extent, Condition, Research and Management Status". FAO, Regional Workshop on the Conservation and Sustainable Management of Coral Reefs. Retrieved 15 October 2007. ^ UNDP (January 2001). "Project Document – Conservation and Sustainable-use of the Gulf of Mannar Biosphere Reserve's Coastal Biodiversity" (PDF). United Nations Development Programme, Global Environment Facility. Archived from the original (PDF) on 15 July 2007. Retrieved 15 October 2007. ^ V.K.Venkataramani and N. Jayakumar (2007). "Biodiversity and biology of marine ornamental reef fishes of Gulf of Mannar – parrotfishes (family: scaridae)" (PDF). Fisheries College and Research Institute, Tamil Nadu Veterinary and Animal Sciences University, Thoothukudi. Archived from the original (PDF) on 27 July 2011. Retrieved 14 October 2007. ^ "Gulf of Mannar isle splits in two, may sink". The Times of India. Retrieved 9 June 2013. Corals images gallery: #1, #2. This page was last edited on 23 April 2019, at 10:40 (UTC).